Welcome to Kate.net Bountiful Thanksgiving! Celebrate Thanksgiving with original, free Thanksgiving wallpapers and Facebook covers, fun printable Thanksgiving coloring pages, a printable and frameable "Give Thanks" sign, printable Thanksgiving place cards, printable Thanksgiving napkin rings, and printable Thanksgiving cupcake or dessert toppers. Original Thanksgiving Wallpapers and original Thanksgiving Facebook Covers (opens in the Kate.net Facebook Covers section) from Kate.net. Print and color two original Thanksgiving coloring pages: "Little Pilgrims" and "Turkey." 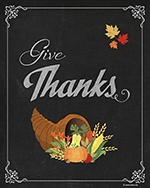 Choose from 3 variations of Thanksgiving place cards to print and use on your holiday table. Print out and frame this 8" x 10" picture to help decorate for the holiday. 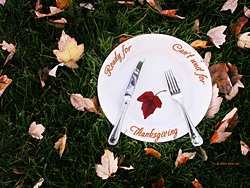 Print out Thanksgiving napkin rings for use with your main table or the "kiddie" table. Create your own standing Thanksgiving turkey decoration for the table, your desk, or anywhere else you need a decoration. Decorate Thanksgiving cupcakes with these printable pilgrim hat turkey toppers.